If you are an Amazon Prime member and have never used the subscribe and save service than you are eligible to receive $10 off your first order of $10 or more. Follow the steps and enroll as the offer ends July 4th 2015 11:59 PST. I have saved hundreds of dollars using coupons available on Amazon and combined them with subscribe and save to enjoy additional 15% each month I have five or more subscriptions. Plus I really hate buying bulk items like toilet paper etc from stores and carry them home, Free Shipping with Amazon is just superb!!! 1. Choose any Subscribe & Save product. 2. On the product page, add the item to your cart by clicking ‘Review Subscription’. 3. Enter promo code TRYSNS10 in the “Gift Cards & Promotional Codes” box. You will then see “Prime Savings” in your Order Summary. See terms and conditions below. Exclusive to paid Prime members. Terms and Conditions Offer ends at 11:59p.m. Pacific time on July 4, 2015. Use promo code TRYSNS10 at checkout for a $10 promotional credit off any qualifying product. This is a limited time offer. Offer only applies to products sold and shipped by Amazon.com. Offer does not apply to digital content. Offer applies to Subscribe & Save orders of qualifying items only. Offer good while supplies last. The maximum benefit you may receive from this offer is $10. This offer is available to customers with no previous Subscribe & Save order history. This offer is available to paid Prime members only. Items must be purchased in a single order and shipped at the same speed to a single address. Amazon reserves the right to modify or cancel the offer at any time. Offer is non-transferable and may not be resold. If any of the products related to this offer are returned, your refund will equal the amount you paid for the product, subject to applicable refund policies. If you violate any of these terms, the offer will be invalid. 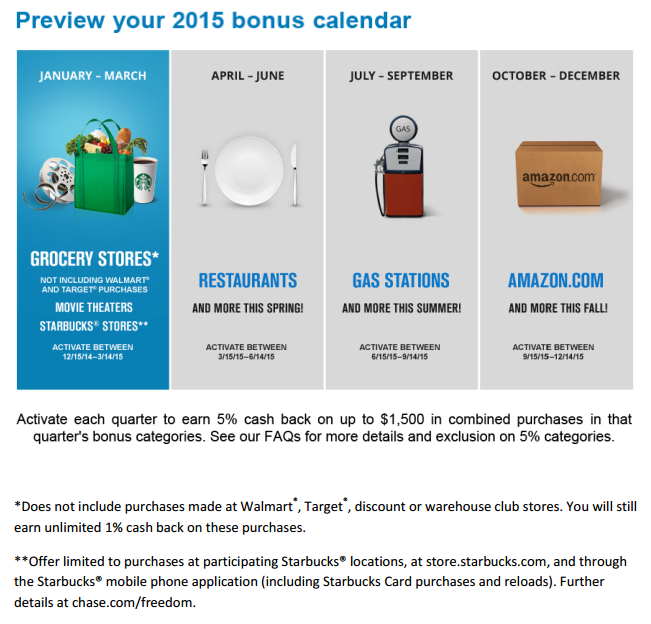 What makes Chase Freedom great is the cash back in rotating categories every quarter. 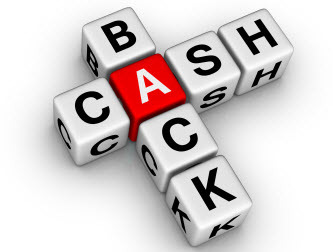 Below is a snapshot for cashback for 2015. The Chase Freedom offers 5% cash back (five points) per dollar spent on rotating quarterly categories, which can translate into a huge return. When you register your card each quarter you then earn 5x points for the first $1,500 spent in those category. This quarter you can maximize your returns by using cards at restaurants. This card has no-annual fees so its a great way to keep a card and not worry about canceling and also establish good credit. If you have been thinking to apply for the Chase Freedom card than now is the time.